The climb up circular stairs to the top of a lighthouse tower is not for the squeamish or for those afraid of heights. Most lighthouses have interesting stories related to their history. Some are open to the public and have “visiting hours.” Others are open only on special occasions. Usually a tour guide will take you through the building and offer you tales of lighthouse living. 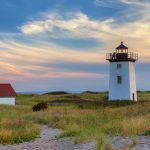 The winding staircases, the distant echo of your footsteps, waves hitting against the rock, distant ship hooting…that’s the dejavu you get when you visit the Cape Cod Lighthouses. It is as if you are part of the whole system that emits navigational lights to guide hundreds of ships to dock safely. Lighthouses are navigational aids that mark the perilous reeds, hazardous shoals and poorly charted coastlines for safe harbor entry. Once upon a time, the lighthouses were the marine pilot’s most important aids but the advent of electronic navigation has led to their decline. The system of lights and lamps on the lighthouses are also expensive to maintain. The vantage points occupied by the lighthouses make them a tourists’ attraction. You’ll go up the winding staircase with your pair of binoculars and voila! The beautiful Cape Cod Coastline spreads right before your eyes. Located in Provincetown, Massachusetts, the Race Point Lighthouse is one of the historical building in the National Register of Historic Places. It was first built in 1816, but the current 45-foot tall tower was built in 1876. Today, it is operated by the American Lighthouse Foundation for overnight stays. To access the lighthouse, you will have to walk for 45 minutes on beautiful coastline sand. Alternatively, you can get a permit from the National Parks Service Oversand to use a 4-wheel vehicle. 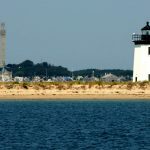 This lighthouse is nestled on the coast to the southwest of Long Point the Provincetown neighborhood of Massachusetts. It is still in operation as it guides vessels approach into the Provincetown Harbor. It was first lighted in 1872 on November 20th. It would be converted to a solar-powered lighthouse in 1981 and enter the register of historic places in 1987. It is the best place to view the harbor and its scenic surroundings. The Long Point Lighthouse graces the southwest entrance of the Provincetown Harbor. Described as “White Square Tower” by the US Coast Guard, this light house emits a green light every 4 seconds that is visible for 8 nautical miles. When visibility is low, it sounds the fog horn every 2 seconds looking for response from its neighbor, the Wood End Light. 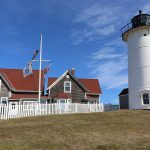 Visit this lighthouse and get transported to the 17th and 18th century Massachusetts. 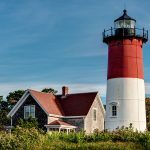 Previously referred to as the Cape Cod Lighthouse, the Highland Light is still operational. It is nestled on the Cape Cod National Seashore. The current structure is a replacement of two earlier ones that had been constructed in 1797 and 1831 respectively. The current lighthouse was constructed in 1857 and it is the oldest of the Cape Code Series of lighthouses. Owned by National Park Service, the lighthouse is open to the public from May through October, but with guided tours. The Nauset Lighthouse is located in Eastham, Massachusetts. It is a 15 meter tall tower that was a restored in 1923 from an 1877 cast iron plate. It sits adjacent to an oil house which was used to store fuel in a bygone era. Today, the beacon on the lighthouse is fully automated for use as a private navigation aid. It is part of the National Register of Historic Places and this a popular tourist attraction. You can get private tours during summer. 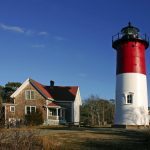 It is operated by the Nauset Light Preservation Society. The Three Sisters are a series of 3 lighthouses located on the Eastham coast of Massachusetts. Due to erosion, the original buildings fell into the sea at around 1890 but were later restored in 1911. In 1923, the brick house was replaced by a cast iron building which was attached to the Keeper’s house. There is a lot of history there for the environment activists looking for tangible sea levels rising data. 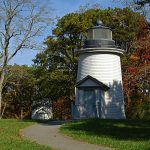 In 1826, the Sandy Neck Lighthouse would be established but a new tower would replace the original one in 1857. The use of the tower was discontinued in 1931 and replaced with a skeleton tower in ’52. As a private navigation tower, the lighthouse was restarted in 2007. 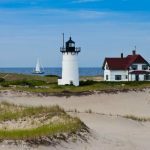 To the southern side of the Cape Cod lies an alluring peninsula rising out of the Buzzards Bay. Its name is Wings Neck. For a chance to see the beautiful peninsula and beyond, you are welcome to mount the stairs of the Wings Neck with a pair of binoculars. The light house is nestled on the southwestern tip and was in operation between 1889 and 1945. Today, it is a private residence and a popular tourist site. 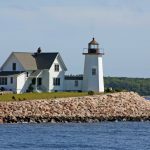 This lighthouse is nestled between Vineyard Sound and Buzzards Bay. The Martha’s Vineyard and the idyllic Nonamesset Island spreads right before you. It was opened in 1826 – just a tower above the keepers house – and then replaced by a 42-feet cast iron tower. It was entered into the National Register of Historic Places in 987 and thus a perfect place to visit to take pictures of the surrounding landscape. Named after Admiral Sir Lewis Bayly of the Royal Navy and a hero of the WWI, the Lewis Bay Light House is a place you go to learn the history of the World Wars I and II. The lighthouse overlooks the beautiful Coastline of Cape Cod. This is lighthouse epitomizes the beauty of West Dennis, Massachusetts. It is owned and operated by the Lighthouse Inn on whose property the tower rises. It is today a seasonal hotel. The lighthouse has been dark for 75 years. On the US Lighthouse Service’ 200th birthday (Aug 7th 1989), the lighthouse was relit. However, it is only lit when the inn is open i.e. between May 1st and October 31st. This was established in 1880 and discontinued in 1933 to be replaced by a 60 meter high skeleton tower. The skeleton tower remains active while the original structure serves as a private residence. The Monomoy Light was founded in 1823 a wood tower and a small brick lantern room atop the Keeper’s House. It was later replaced with a cast iron tower in 1849. 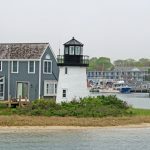 The lighthouse’ demise would be brought about by the construction of the Cape Cod Canal in 1914 which provided a safer and a shorter route to the Boston Area. It was discontinued in 1923 and added into the National Register of Historic Places in ’79. 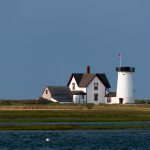 The Keeper’s house is today a guest house and gives an access to the Monomoy Wilderness. Prior to 1923, the Chatham Lighthouse was referred to as Twin Lights. It is located on the edge of Cape Cod’s ‘Elbow’. The lighthouse was first built in 1808 with wood and later replaced by another two wooden towers in 1841. In 1877, two new cast iron towers were built, one of which would be transferred to Eastham to become Nauset Lighthouse in 1923. Lighthouses come with documented knowledge of the past, vantage points to view the present beauty, and a sense of adventure into a past when seafaring was a business of the noble. Do yourself a favor; visit some of the above lighthouses and this will be one of the most interesting adventures you’ll ever have.